ATTENTION: As of the date of this post (November 13th, 2014) I'm no longer publishing new diary entries or offering free content from my post-apocalyptic blog The Greenland Diaries. Days 1 - 100 are now available in paperback and on Amazon's Kindle. This novel form, which was recently published by Calamities Press, is doing excellent and I recently sold it at Crypticon 2014 here in Minneapolis, Minnesota. Days 101 - 140 were still available for free on this website, but I've taken them down as they will be released in novel form in Fall 2015 Days 101 - 200. I will still be updating this blog and occasionally showing some new content about the days and what's happening in this world. 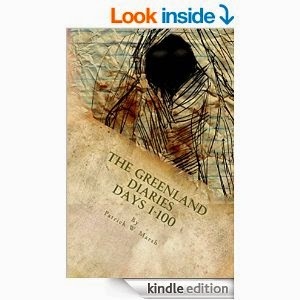 The Greenland Diaries is by far my most successful story to date. Over 30,000 people have viewed the blog. I've always struggled with what style I should write in, nonfiction or fiction, and this blog has been the perfect mix. I literally took my life as it was and incorporated monsters into it. More of me is in this story than you realize. I want to thank everyone who kept this blog a success. My subscribers, followers, and fellow authors who have supported me with such extreme vigor, thank you. I'm honored to have started this story as such a little and meaningless writing exercise to practice writing in past-tense. Before I remove the available days, I will post links to the book right below this message. Big things are happening with this story. Will the main character survive much longer? When will the days end? What are the Unnamed? Can you trust the Reanimated? Thank you everyone. Again, this started as nothing, but I'm trying to make it something. Thank you.